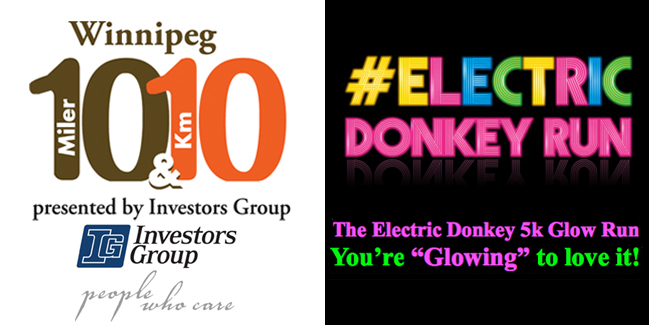 CHILDREN'S HOSPITAL FOUNDATION OF MANITOBA, Inc.
**Online registration is closed, but we will still be taking Registrations for Electric Donkey and Wpg 10 & 10 at Race Kit Pick UP Thurs, Fri and Sat. *All family registrations receive a Glow Pack and T-Shirt. Due to River levels that STILL won�t drop, we have had to re-do our 30km route to extend out West, you will continue to go West at the 10 mile route turnaround point, this is the starting point of the map. We apologize for the delay in posting the alternative route, please know that City approval and permits are necessary before posting a route, this alternative route had to go thru the City and it�s a very busy time for them. THANK YOU FOR YOUR PATIENCE! We are so excited you are joining us for our first ever 30km city race! Start/Finish is at Osborne and Broadway. �No Saturday Night On-Site Package Pick up at the The Forks. Additional Glow Merchandise available to purchase at Package Pick up! Start at The Forks, finish at The MB Legislature, take in the downtown festival Manyfest along Broadway while walking back to your car! Donations to the Children�s Hospital Fdn of Manitoba, for their playdeck! Race will begin approx. 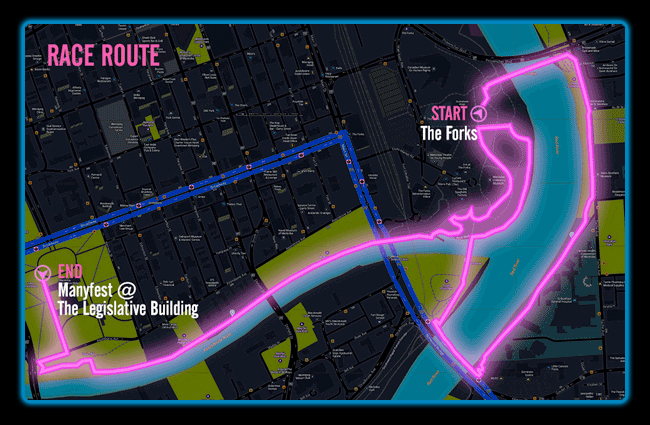 8:30pm from Scotia Bank Theatre at The Forks, come for 8pm dressed in your Glow Gear for Warm Up, DJ and Music! Once runners hit the 10 mile turnaround point in Assin Park, they continue West, out of the Park along Vialoux to the Moray St bridge, staying on the east side, go across Moray bridge and proceeds directly under and into Woodhaven area. Over to the pedestrian bridge then up Glendale to path at Community center. Follow path to Woodhaven Blvd cross road and continue on Sturgeon Creek path under Portage and follow path along Sturgeon Creek all the way to Ness. Turn down Alcott, onto Amaranth and do a turn around on Amaranth and return via Sturgeon Trail to Glendale and Assiniboine. Go west on Assiniboine, north on Woodhaven, west on Emo, south on Oakdean and east on Assiniboine back to Assiniboine and Glendale. Return to Assiniboine Park and back onto the 10 mile route and eventually to start/finish line. Remember being a kid when Mom told you to be in when the streetlights came on. Don’t listen to Mom! We all know the best stuff happens at night. 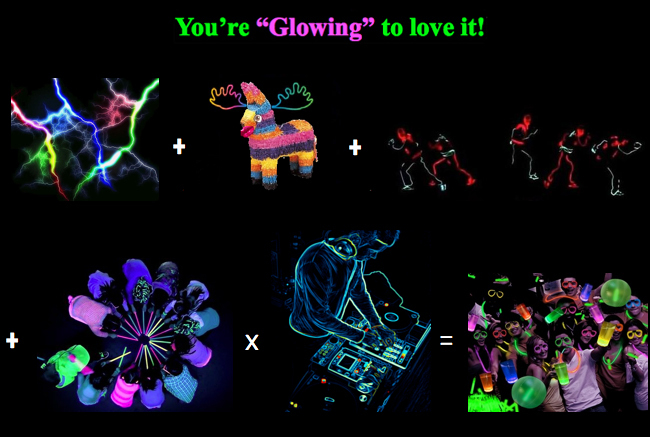 Give yourself permission to HAVE FUN because it’s “GLOW” time! Join in the fun and Walk or Run or Dance your cares away! Dress to impress and glow from head to toe (as a matter of fact…) then immerse yourself in an experience that will leave you glowing from ear to ear! Kids, tweens, teens, parents, adults... Hey even bring grandma… (she can probably still cut a rug)! September 6th, 2014 The Running Room, Winnipeg 10 & 10, Virgin 103 and Swamp Donkey Adventure Racing bring you the time of your life! 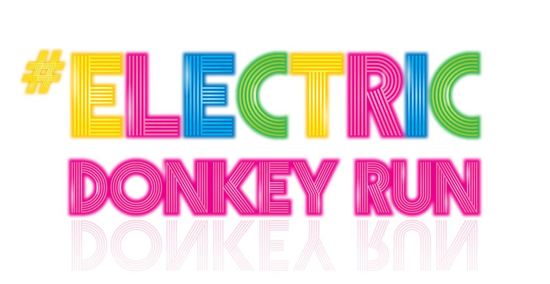 No exclusive membership required… 5k Glow Party - The Electric Donkey Run. View Processing Fees Remember to check back regularly for updates on race information! It’s Simple! When you register for an event you will be prompted to set up a Free member login account. You can login when you enter the race or after registering. If you will be collecting donations for this event's charity, you have to be logged in to access the Donations tab. If you are not a member please sign up for a free account. Creating an account will allow you to customize personal home pages to begin tracking and soliciting donations for your favorite charities.